Perfect comfort. 6ft electric bed/s. 49" TV. Secluded garden. Country views. 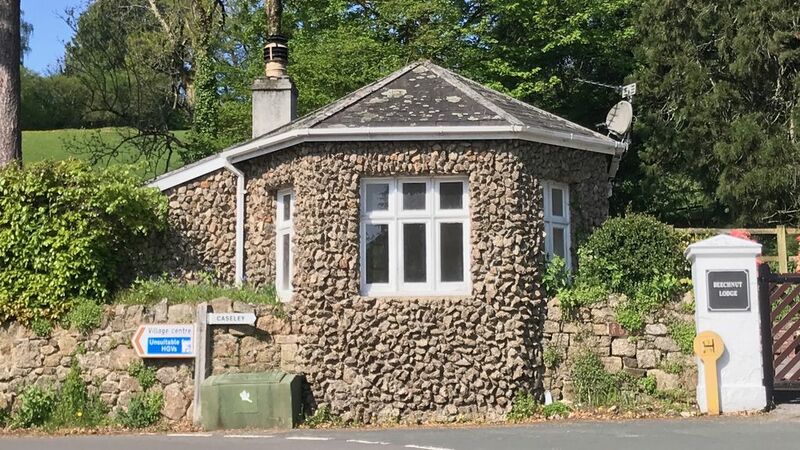 Beechnut Lodge is a 'perfect for two' luxury cottage in the pretty Dartmoor village of Lustleigh. I have owned Beechnut for many years but only now have decided to make it available to guests and so, with luxury in mind, have taken it back to bare walls for a complete refurbishment and everything inside and out is carefully chosen to provide the utmost comfort. The bedroom has a super comfortable 6ft x 6.6ft electric adjustable, twin-linked bed with individual controls to help you find your best sleeping position. There is plenty of drawer and wardrobe storage for your clothes and French doors lead out into the pretty patio and garden. The ensuite is brand new with a large shower enclosure. In the lounge a large, electric reclining sofa invites you to sit in comfort whilst a 49" 4K UHDV TV provides your evening entertainment. An Amazon Echo provides all your music and radio ... just 'ask Alexa' and your favourites can be playing in seconds. The dining table and comfy, quirky chairs are set in the bay window so you can enjoy the view and the sunshine with your breakfast. The fireplace is as old as the cottage but with modern touches .... a pretty electric stove provides extra heat and a comfortable glow but for 'real fire' enthusiasts all the equipment needed is in the summer house ready for your use. The kitchen is small but very well equipped with a Nespresso machine, ceramic-hob oven, fridge-freezer and microwave etc However, for now we don't have a washing machine or dishwasher. We hope that, like us, you wouldn't dream of doing your washing on holiday and that washing a few dishes to wash won't be too arduous a task. There is free WiFi with high-speed fibre broadband. The pretty private country garden is a natural haven for flowers and wildlife and is wonderful for relaxing in sunshine or shade. Lie back on one of the comfortable sun loungers whilst watching the fearless baby rabbits, the resident robins, the squirrels and the Roe deer in the neighbouring field, or simply snooze in the sun. Within the garden there is a lockable summerhouse for safe storage of bicycles and golf gear etc. A few minutes walk along a country lane takes you to the picturesque heart of Lustleigh village with its ancient thatched buildings, the pretty Cleave Inn serves excellent food and dogs are welcome, the Primrose Tearooms provides light meals and wonderful afternoon teas and the Dairy is the well stocked shop village shop for all your provisions. Lustleigh hosts several events such as the well known Lustleigh May Fair which includes, stalls, games and traditional cream teas, a flower filled procession, led by a brass band, Maypole and Morris dancing and the crowning of the May Queen on a granite throne in the Orchard. Other events such as open air Theatre in the Orchard, events in the village hall and the famous Lustleigh August show are all to be eagerly anticipated. For more shops, restaurants and other amenities the small towns of Bovey Tracey and Moretonhampstead are just a few miles away. Lustleigh and it's famous river valley, the Cleave, is well known for wonderful walking opportunities and it would be easy to spend a whole week on foot, simply discovering all the ancient lanes and byways that criss cross the area. However those, like us, who are now less able, or willing, to walk for miles will also find that Beechnut is perfectly placed for exploring all of Dartmoor and Devon by car. The coast is only about 12 miles away, Dartmoor is on your doorstep and there is a huge choice of National Trust properties to visit in Devon. Anyone wishing to explore by bike will also enjoy finding the many routes around the region and a quick internet search will reveal many opportunities for interesting rides. Golfers too are well served, within a few miles is a 9 hole course at Bovey Tracey and just slightly further away are the challenging courses at Bovey Castle and Stover. I am a true Devonian. Born in Teignmouth and only living 2 miles from there now ... it could be said that I haven't gone far! I am retired now but I am fortunate to have had a very interesting life .... I grew up on my parents Devon farm, trained and worked as a nurse, have run a couple of successful businesses and now with my husband am enjoying retirement and fitting in as much travelling as time and health will allow. We have always loved Dartmoor, and Lustleigh in particular, so when, one day after a walk and visit to the Cleave Inn, we saw a For Sale board outside Honeysuckle and Beechnut Lodges we were excited at the prospect of owning these beautiful little gems. At first we ran Honeysuckle as a holiday let and it was extremely popular but a few years later a house move meant it was impractical for this to continue and we sold it to a couple staying there on holiday to use as their own special retreat. We kept Beechnut and for many years it was occupied by a long-tern tenant. Now he has left and we have completely refurbished this gorgeous little lodge to make a perfect holiday venue for 2. We will of course enjoy many stays there ourselves but look forward to welcoming others to share in our unique little home. Beechnut is a lovable little house. Perfect for young and old, it is supremely comfortable with electric adjustable twin-linked beds (made up as a super-king on request), electric recliner sofa, a huge 4K TV, super fast broadband WiFI and a lovely natural, private garden. It is set in one of the most picturesque villages in Devon and is within the Dartmoor National Park. Just come and see for yourself I am sure that you too will be entranced by this quaint 200 year old 'bungalow'. The en-suite shower room has a large shower enclosure and there is a shaver socket at the side of the bathroom mirror. The beaches at Teignmouth, Dawlish and Torbay are all about 12-15 miles away. The cathedral city of Exeter is about 20 minutes away by car and Plymouth is a little further. Not exactly mountains but beautiful tree clad hills surround Lustleigh and Beechnut and its gardens overlook this lovely view. Lustleigh is about 12-15 miles from the sea at Teignmouth, Dawlish and Torquay. This is a beautiful sheltered valley on the edge of the Dartmoor National Park. footpaths criss cross the area and it is perfect for anyone who likes nature and the countryside. Lustleigh village is renowned for its picturesque nature and setting and it has all the essential facilities that anyone could require.... a good pub ....a lovely tearooms and a great village shop. Under 2 miles for Lustleigh are the Hennock reservoirs. Anyone young or fit can easily walk there by footpath or anyone less fit (like me) can drive there for lovely level walking around the 'lakes'. No telephone but mobile signal is good. The cottage is very cosy with thick walls and super efficient electric radiators and an electric stove in the fireplace or open fire if required. We have an open fire place, but most people prefer not to bother and use the great little electric stove for instant heat. There is no parking inside the property grounds but there is ample unrestricted parking just outside Beechnut. Super comfortable, cosy and welcoming with a 49" smart TV. Nespresso machine with coffee pods. We will leave you a good welcome pack with tea, coffee, milk, biscuits, breakfast provisions, wine, and probably a few other little surprises! Half moon dining table that folds out to make a lovely round table ideal for dining or working. 'Stereo' may not be the correct word, but we have an Amazon Echo so you can listen to all your favourite music or radio stations on request from Alexa! There are a number of favourite board games in the cottage. The garden is natural and very private. In spring there is an abundance of wild flowers. Deer, rabbits and birds of all kinds can be seen in the garden and neighbouring fields. Comfy bistro set for al fresco dining. Sun loungers Two more comfy chairs at the top of the garden to take in the view. The cottage provides perfect comfort and the electric adjustable beds/bed means you can choose your perfect sleeping position, from normal to sitting, without the hassle of loads of pillows. It's great too for a romantic "breakfast in bed'. The sofa is similarly adjustable and you can sit, or lie back, in luxury while you enjoy the 49" 4K UHDV TV. There is a great summerhouse for your use where you can safely store bikes, golf gear and walking boots etc. We leave you a welcome pack which includes: everyday provisions, breakfast items and a few treats. Lustleigh is within the beautiful Dartmoor National Park. It has a wonderful pub, a lovely tearooms and a great village shop. Ancient footpaths criss-cross the area. All of Devon is within easy reach. Many National Trust properties are close at hand: Castle Drogo, Killerton, Knighthays, Saltram, Cothele, Greenaways, Colaton Fishacre and many more. One of the UK's finest restaurants, Gidleigh Park, is only about 12 miles away, near Chagford. Bovey Castle hotel is even closer and does a fabulous afternoon tea. Many little Devon pubs and restaurants dot the area and you can choose somewhere different to eat every day. The coast at Teignmouth is only about 12 miles away and Torquay a little further at 15 miles. There are many good golf courses around. The nearest full 9 hole course at Bovey Tracey is less than 3 miles away whilst there are challenging 18 hole courses at Mortonhampstead and Stover. Lustleigh is famous for its walking opportunities. Don't leave without finding Wreyland. This adjacent hamlet is one of quaintest and prettiest places you can find anywhere.